Wholesale Supplier of a wide range of products which include ankle binder, anklet comfeel, foot drop splint, ankle support, walker boot and foot raiser. 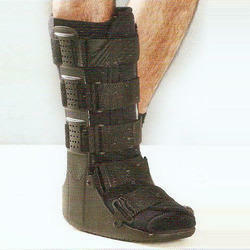 With the extensive knowledge and experience in this respective domain we are offering Ankle Binder. The available ankle binders are manufactured under the direction of vendor’s professionals using supreme quality material following set standards. 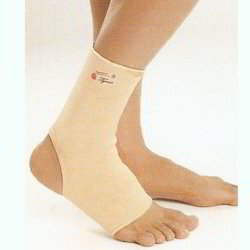 These ankle binders are elasticized wrap in figure of eight stabilizes ankle. 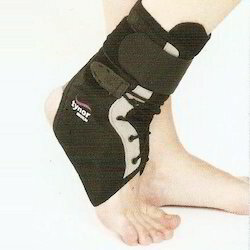 Customers can easily avail these ankle binders from us on diverse specifications. With firm commitment to quality, we are presenting for our clients a vast range of Anklet Comfeel. This product has two layered with interwoven air space retains therapeutic warmth. Our product is manufactured using high quality material and sophisticated technology in fulfillment with the set industry standards. Besides, the offered product is provided within a stipulated time frame with several specifications. 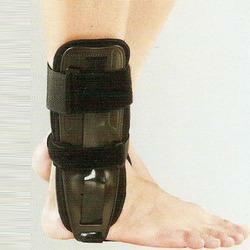 Pioneers in the industry, we are offering an excellent range of Foot Drop Splint. The product is valued in the market owing to its optimum quality. Offered product is inspected on varied parameters in order to supply a flawless range. Our vendors manufactured this product using excellent quality of material & contemporary techniques by vendor’s highly skilled technocrats as per the norms of industry. We are the highly coveted and widely acclaimed wholesaler and supplier of Anklet that is simple pull on application is easy to use. Our offered anklet provides effective compression, comfort and no buckling of fabric. This anklet is examined by quality experts so as to deliver a flawless range at customer’s end. We provide this anklet from us within a committed time frame at market price. Moulded foot & rocker sole, promote early ambulation, improves gait & protects lower leg. Customizable, aluminum bars offer rigid support, & improved immobilization. Foam liner ensures comfort & perfect fitting of the leg in the orthosis. Hook loop system, ensure perfect grip & improved stabilization. It also allows inspection, personal hygiene and easy application. 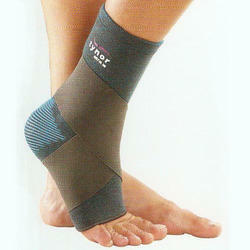 Lifts, and supports the ankle in dorsi-flexion. Lace mechanism maintainsthe degree of dorsiflexion at 85-90, with 10-15 degree adjustment. Versatile device, suitable, to act as a night or a day splint to speed up healing. Worn with or without shoe. Constructed from PP sheet for durability A strength. Covered with PUF fused fabric for cushioning and comfort. Triple stabilization through hook loop closures, lace tightening , & rigid splinting, ensure firm protection. Rigid, anatomic splints ensure strong immobilization of both dorsi & plantar flexion movement, It also gives sufficient room for malleolus. PUF fused, matte fabric body ensures durability, high cushion-ning, enhanced comfort,& pleasing aesthetics. Lace pull mechanism, ensures single stroke tightening. Molded splint with perfect anatomy ensures good immobilization & pleasing aesthetics. Unique figure of eight strapping improves grip and control on inversion/eversion movement. Molded Ethafoam pad provides optimal cushioning. Large room for ankle can accommodate, swollen or distorted ankles. Neoprene sleeves protect from abrasion and pressure of tight straps. Looking for Ankle Support ?